The Confraternity of the Holy Apostles was envisioned in 2013 as a way to promote and encourage ecumenism among Christians. Because of errors of history and disagreements, Christians have been divided to the present times. The words of His Holiness Pope John Paul II provided insight into the need for the Confraternity. "Restoration of unity among Christians is one of the main concerns of the Church... and this task is for all of us. No one can claim exemption from this responsibility. Indeed, everybody can make some contribution, however small it may seem, and all are called to that interior conversion which is the essential condition for ecumenism." Also invoked are the words of Patriarch Bartholomew of Constantinople: "Our faith is not a compilation of diverse opinions promulgated to integrate discussion in a harmonious way; it is the revelation of the singular truth expressed through and in the divine person of Jesus Christ." All Christians, both lay and clergy, who are interested in ecumenism are invited to join the Confraternity. It should be noted that there is no screening process for joining the Confraternity, and that the Confraternity assumes no liability for any of its members. Membership is free. However, members may wish to purchase a membership packet below that includes a medal, membership certificate, and prayer for Christian unity. Praying for Christian Unity: Let us pray. O Lord Jesus Christ, who saidst unto Thine Apostles: Peace I leave you, My peace I give to you; regard not our sins, but the faith of Thy Church, and grant unto her that peace and unity which are agreeable to Thy Will; Who livest and reignest ever, one God, world without end. Amen. Promotion, where possible, of Christian unity. Members are especially remembered at Holy Mass during the Feast of Ss. Peter and Paul. Membership Package. Includes the medal, membership certificate, copy of prayer, holy card, and shipping. 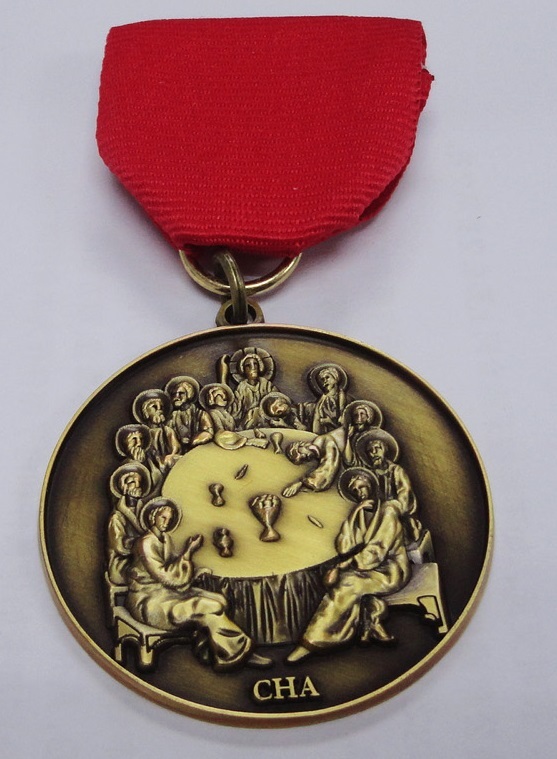 The medal measures 1 3/4 inches.